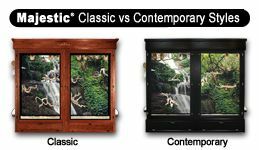 All Majestic Bird and Reptile Cages, hoods and stands come standard in solid Oak wood material with one of the four stain colors shown left, or Hard Maple Wood finished with Black or White paint. Please note that painted colors will not show wood grain as much as the stain choices. Other custom wood, stain, and paint combinations as well as other wood types such as Cherry, Walnut, etc. are available for an extra charge. Please give us a call and we would be happy to explain your options!